Pancakes…mmmmm! Which type should I make? American style, french crêpe, ricotta hotcakes, galette, gridle cake, pfannkuchen, pannenkoeken, poffertjes, palacinky, palacsinta, blini, drop scones, pikelets, crumpets, waffles the list goes on. Or so the internet tells me! They all have flour, milk and eggs. Some use yeast as a leavening agent others use baking powder some even use yoghurt or buttermilk. 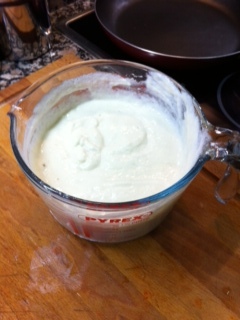 which as it hits the heat reacts creating a fluffy, light pancake. On this occasion, and purely because I had a tub of it in the fridge when I planned this weekend’s cooking, I decided on Ricotta Hotcakes. A surprisingly easy recipe to follow. Creating the batter for these hotcakes is simple. You need to whisk the egg whites before mixing them into the batter mixture but to be honest, this is not strenuous work. Even bleary-eyed and jauntily dressed in stripey Pj’s this is manageable. I do have to say I was tempted to use the electric food mixer but I’m not quite sure my neighbours would have appreciated the racket it makes in the still of an 8 o’clock Sunday morning. 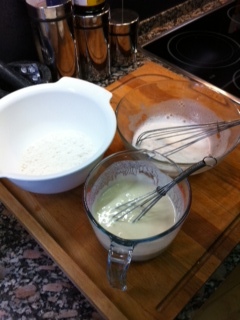 Top Tip: add salt to the egg whites before whisking as this helps them froth up a treat!! Once you fold the egg whites into the batter you are ready for lift off. a light lemon flavoured doughnut. It was due to this that I added the raspberries and blueberries. Even though I am sure they would be just as delicious doused in maple syrup. However, I wouldn’t recommend bacon with these! The only downside is that I’ve got to wait another 7 days before I’m going to be attempting them again! 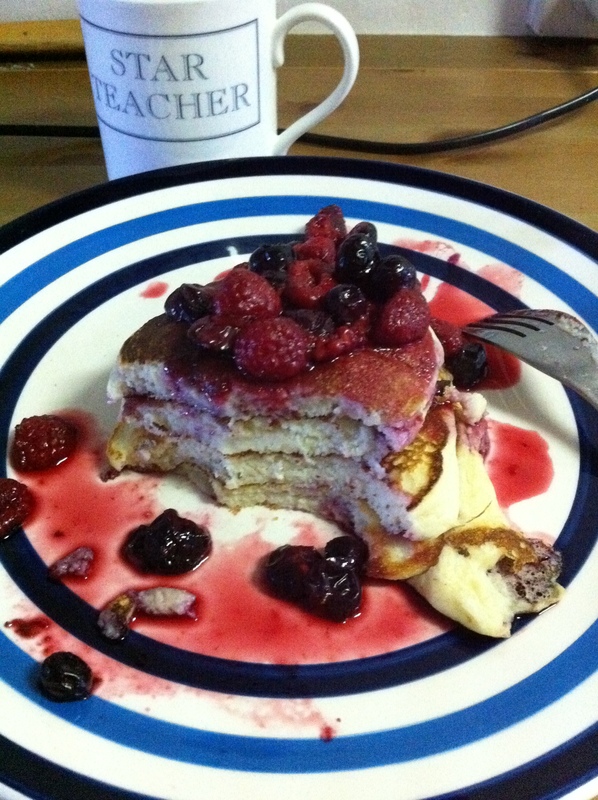 Or perhaps next time I’ll dispense with the ricotta version and make american style gridle cakes. Que bueno! Much nicer than the banana I had for breakfast today! Lol!